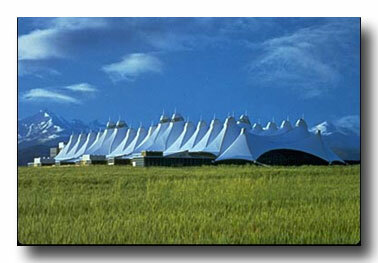 Eagle County Regional Airport - is just off I-70 in the western part of Eagle County. There are several flights during the ski season offered by American, Delta and United each day to and from some larger US cities. From here it is a 30 minute drive to Beaver Creek and a 35 minute drive to Vail Village by rental car, limo or van. Denver International Airport (DIA) - is just off I-70 northeast of Denver so plan on a minimum of two hours (in good weather) to drive from DIA to Vail, Beaver Creek is 15 minutes further west and Eagle is another 30 minutes west. It is served by all major US airlines and several commuters. You can rent cars there or take van and limo service to get to the Vail Valley. Many airlines offer service at the Denver International Airport (DIA) which is a 2 to 2 1/2 hour drive in good traffic and weather from Vail and Beaver Creek. Colorado - You can fly into Denver International Airport (DIA) or into Eagle County Regional Airport (EGE). DIA is approximately 2 hours (by air) east of Los Angeles and San Francisco, 1.5 hours north of Dallas and Houston, 2 hours west of Chicago, and about 4 hours west of the east coast (NYC, Wash DC, Miami). Denver is the capital city of Colorado and the major connection point for out-of-state visitors. Colorado Map . Colorado Government Website. Eagle County - is the home of Vail and Beaver Creek Resorts and is approximately 110 miles west of Denver International Airport (DIA). You can rent a car at DIA or you can take a van from the airport; this "might be" a good option because once in Vail or Beaver Creek a car is very often not needed. Alternatively, you can fly directly into Eagle County Airport (EGE) which is 30-40 minutes west of Beaver Creek and Vail. Eagle County Map . Eagle County Website. Real Estate in the Vail Valley . . .